Gardner Denver has released the new air-cooled version of its Ultima technology. Gardner Denver has extended its oil-free Ultima compressor range with a new air-cooled version of its Ultima technology, the first air-cooled oil-free compressor to offer heat recovery for process water. The air-cooled model can recover up to 98% of heat generated during compression. 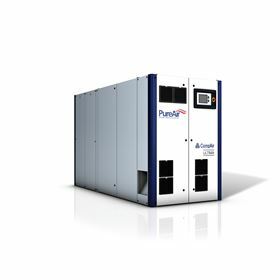 The technology’s closed package cooling system means the energy captured when compressing air can be used to provide process water heating, delivering usable water temperatures of up to 85oC. Operators can choose between either air-cooling, water-cooling or both. The Ultima compressor has highly-engineered oil-free airends, designed and manufactured in Germany and featuring a special coating to help protect machinery and avoid performance degradation throughout its lifetime. Ultima is available with a pressure range from 4 to 10 bar, volume flow from 6.7 to 23.9 m3/min at 8 bar, and motor power from 75 to 160 kW. It is equipped with iConn, Gardner Denver’s digital analytics platform, which helps operators to measure and optimise compressed air usage. The design of the compressor features two permanent magnetic motors replacing the traditional gearbox set-up. The variable-speed motors can achieve speeds of up to 22,000 RPM and efficiencies greater than IE4.